Another front-line mortgage story… who benefits from California’s new autograph law… two good questions about our sales messages… and more! For the moment… the market’s Trump-agenda-in-peril freakout is over. As we check our screens, the Dow industrials have recovered about 60 of the 373 points they lost yesterday. Gold has shed a few bucks of yesterday’s big run-up, the bid now $1,252. And Treasury rates are backing up, the 10-year at 2.22%. Has the foundering ship of state been righted now that a special counsel’s been named to look into “Kremlingate”? Seems unlikely. “Trump will not be impeached,” says a note from Jim Rickards — in contrast to the mainstream consensus now seriously contemplating a President Pence. But the damage is done to the Trump agenda, for sure: “The dysfunction in Washington will have real-world consequences for markets,” Jim goes on. Perhaps the only thing that has a prayer of passage in Congress right now is… marijuana reform. “Republican and Democratic senators on Wednesday renewed their drive to make banking easier for marijuana-based businesses in those U.S. states where the drug is legal,” says a Reuters dispatch. For the moment, the banking system is off-limits to legal marijuana businesses. They’re cash-only… even to the point of delivering their state tax payments in cash. The bill would change all that, forbidding the feds from interfering with banks that take on pot businesses as customers. Elsewhere in the Beltway, the oldest and largest marijuana industry conference and expo in the country is underway. The venue is the Gaylord National Resort & Convention Center. Our Ray Blanco showed up a couple of days early for private briefings from some of the industry’s up-and-coming players. In the meantime, our proprietary Penny Pot Index is taking a breather. Ray’s not concerned. “Markets climb and they correct. That’s the expected pattern that we see repeating over and over again. 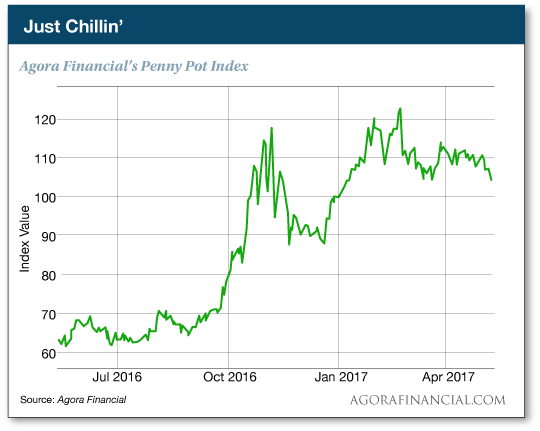 “If anything,” Ray goes on, “the recent correction in the pot market is a sign that many of these ragtag tiny stocks are actually maturing. After all, recent rallies in pot stocks have been orderly, and the corrections have been too. This is the sort of price behavior you’d expect to see in a more stable corner of the market — and that’s a good thing. “Make no mistake, I’m not saying that pot stocks are turning into big, boring stocks that mirror the rest of the market,” Ray makes clear. “They’re not, and they won’t. The gain potential in pot investments is utterly massive. Period. That means you can now buy with more confidence in the “penny pot flashes” that our proprietary trading system generates. You’re less likely to get whipsawed and shaken out. And it’s still your fastest route to cannabis riches. Ray shows you how the system works right here. Yesterday’s 1.8% drop in the U.S. market is nothing compared with today’s 9.8% drop in Brazil’s market. The interim president — the one who replaced the one who was impeached — was caught on audio egging on a corporate CEO to pay hush money to a jailed lawmaker. All of this year’s gains in Brazil’s Bovespa index have been wiped out in a matter of hours. Mid-Atlantic manufacturing is insanely strong, judging by the “Philly Fed” survey. The May reading is the second-highest since 1983. That’s an interesting contrast to Monday’s report from New York state, which shows manufacturing there is slowing down. Don’t bet against bank stocks — even if the Trump agenda’s dead in the water — says the newest addition to our team, Chris Whalen. Financials were among the hardest-hit sectors yesterday. For days now, mainstream analysts have been hanging crepe about the impact on financial stocks if tax cuts and other changes don’t happen. But Chris says those analysts overlook two important short-term factors. First is the Federal Reserve’s plans to raise interest rates again next month — and yesterday’s hiccup in the markets won’t change that. Second is the Fed’s next round of “stress tests” for the banks. Banks that pass the tests are likely to step up the pace of share buybacks. 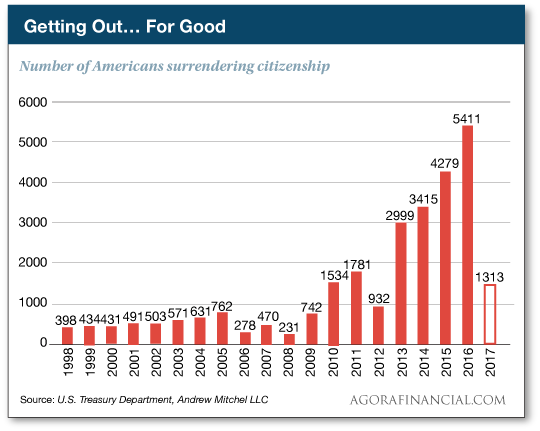 So far this year, the number of Americans giving up their citizenship is keeping up last year’s blistering pace. Last year set a record with 5,411 published expatriates. For the first quarter of this year, the IRS says it’s 1,313; assuming that holds the rest of the year, 2017 will fall just short of last year’s total. As we’ve been saying for years — long before it became trendy for Drudge to post these numbers — the trend is driven by Americans already living overseas who are fed up with onerous banking and tax requirements. It’s just easier to turn in their passports. And the IRS numbers might well be understated, according to international tax lawyer Andrew Mitchel — who follows these numbers more closely than anyone else: “During the first quarter of 2017,” he writes, “the FBI added 1,484 individuals who renounced their U.S. citizenship to the NICS index. “Dave, the problems in retail definitely seem to be about more than Amazon, or how stretched consumers are,” writes one of our regulars. “It’s a fascinating issue. “Brick-and-mortar retailers (other than Wal-Mart) who have a fighting chance could be those who sell things people want to visually inspect before buying: auto parts, groceries and home improvement supplies. Overall, these players have been doing pretty well. But pretty much every other specialty is struggling. “Not that everyone in those three niches will get through the bloodbath unscathed. It could get ugly — and a few might not survive. AMZN and WMT are putting fierce pressure on everyone. The 5: Oh, yes. We expect one final washout a week from today. “I have been a loan originator in the mortgage industry since 2002,” writes a reader — continuing our thread about who’s to blame for the mortgage crisis of a decade ago. “My first six years, I worked for the largest lender in the country (which is no longer in business). Between 2004–08, the management of that company pushed us to sell negative amortization loans, also called ‘option ARMs.’ These loans had payment options but one option allowed the borrower to pay a minimum payment that was less than interest only. When the client made that min payment, their balance would increase. Then when property values dropped, the borrowers owed more than the property was worth… Hence, all the foreclosures. “Management said that these loans were the most profitable and we were leaving money on the table for the company and ourselves if we did not promote these loans to clients. They used their sales force in Florida as an example. They said 60% of all mortgages originated in Florida by this company were option ARM loans, but here in Arizona only 18% were. “As you probably know,” writes another regular, “I love reading The 5 and the thought that you typically put into covering the hidden, or at least uncovered, story within certain headlines. “I’m not even going to try to hide this ‘big but,’ though. “But your snippet Tuesday about bookstores being strangled by regulation seemed to miss the real story, which is who is sponsoring this legislation and why? “Don’t you at least wonder why, with ‘Rome burning’ on so many other important matters, that lawmakers would spend their time on, of all things, protecting us against forged book autographs? “Who has something to gain with this legislation seems to be the real story. The 5: Thanks for keeping us on our toes. You’re absolutely correct. The new California law carves out an exception for pawnshops and online retailers. The 5: You have a keen eye. First question: The sales emails have only one aim — to induce you to click to the sales promotion. But in our daily episodes of The 5, we have a different, dual, objective — that you learn at least one thing you didn’t know before, and that you come back the next day. If we also induce you to subscribe to another paid publication on top of the one(s) you already get, that’s gravy. Second question: I do review those sales emails before they go out. (Occasionally, one slips through the cracks. In any event, they’re the only thing that go out over my name that I don’t write myself.) Sometimes I change a word or two. On occasion I kick them back to the copywriter to try again and come up with something more consistent with our general editorial stance. Do you see the woman to the left? But it could change the world forever. I haven’t seen anyone else cover this story like our team. But we’re leaving this information up for only a limited amount of time, right here. After tomorrow it’s gone. You’ll see why when you watch.